Elettronica FM, is an industrial company with a consolidated experience in the design of electronic systems. 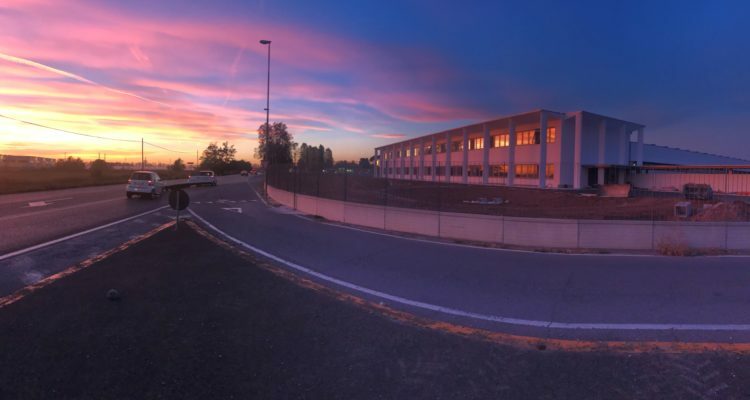 FM is managed by an enlightened entrepreneur, Mauro Ferrari, tenaciously linked to his territory, where, in 2015, he decided to invest and build the first industrial building in Class A ++, power is self supplied, in order to reduce indirect production costs; those costs which penalize those who want to compete with world market. The inclusion and respect for the environment are the guidelines in the design and construction choices, from the raw materials to the designed architectural details. The building is located in the industrial area of ​​Guidizzolo, and is placed as a limit to the cultivation of the green Mantovana plain, on which the two white volumes that make it stand out. The facility is distinguished in production environments, managerial and representative spaces. The first volume has a horizontal pattern, defined by panels, openings and continuous shelter. These elements are kept in the second volume, shaded by a colonnade that supports a cornice. The colonnade, made up of full-height pillars with semi-oval section, defines the front on which its long shadows project, supporting the cornice at the top, composed of cantilevered elements with trapezoidal section, which acts as a hat to the building conferring its elegance. The colonnade, which will be completed with sunscreen and photovoltaic elements in order to regulate the lighting in the interior, gives this part of the building a peaceful monumentality and defines the directional and representation volumes making them distinct from the surrounding environment and recognizable with respect to the other volume. The volume that houses the activities for the production, with its lower height, extends into the surrounding environment, welcoming it inside through the wide openings along the perimeter walls, regulating the shading of the façade through a continuous shelter, spreading the natural lighting through the sheds in coverage. An accurate study of the alternating roofing element and shed opening limits the irradiation effects. The wide spans amplify the diffusion of natural light, as well as allowing a free provision of equipment and allow an effective organization of operational activities. In addition to this, the interior spaces have a controlled temperature and are shielded from electromagnetic waves. In coverage of the production area, a photovoltaic system of Elettronica FM is installed and tested, in which each single panel is equipped with a solar micro inverter. The volumes, in contrast with the surrounding greenery, stand out for their white color. The prefabricated products that define the enclosure, panels, canopies, columns and cornice are made of white TX Active® cement. TX Active® is the photocatalytic principle for cement products able to reduce the pollutants present in the air, improves air quality and maintains the aesthetic characteristics of buildings over time. The volumes with horizontal development, the importance of the main front, the contrast with the plain, refer to the architecture of the Palladian villas. They too were workshops operating in the environment in which they are still inserted. In addition to being a sign of industriousness and industriousness, recognized in the world.